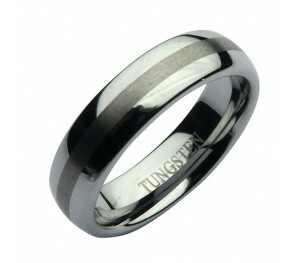 A strong 6mm tungsten carbide court shaped high polished wedding ring band with a matte stripe running through the centre.Ideal as either a fashion ring or as an alternative to a traditional wedding ring band, this wedding band boasts a court shape profile offering clean, sharp lines with a comfort fit. 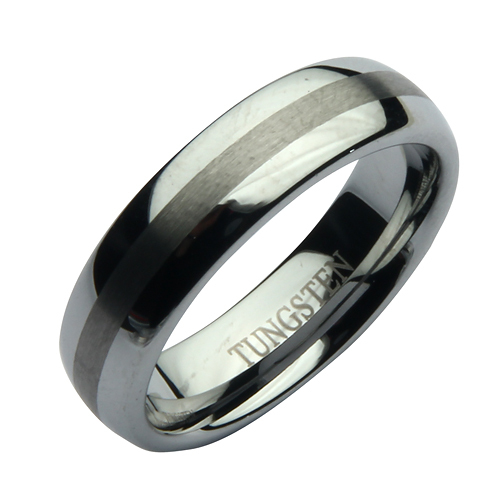 Tungsten's strength and impressive scratch-resistance makes this an affordable wedding band which is anything but ordinary. Court wedding rings are rounded both inside and out for a comfortable fit. Wrapped in an elegant box . my husband bought this ring for me earlier this year I wear it everyday and honestly it's still as new, he's commented on it several times, so I ordered one for him yesterday it's came this morning, he's over the moon with it really is, it's a lovely chunky ring and excellent value. Ordered yesterday came today, astonishing can't complain, this is my third ring from elma jewellery first tungsten ring though, you can't beat the price I paid, the ring itself is just stunning, I recommend any one to purchase a piece of jewellery from Elma you won't regret it honestly. This ring came today and it looks even nicer in person. The speed of delivery if great it has come 2 days earlier than estimated which who doesn't love that. Thank you for the great service and fantastic product.